Vincent Scordo, from the notable Scordo.com, recently posted a fabulous recipe, Ciabatta Roll with Tomato, Basil, Santisi Extra Virgin Olive Oil, and Fillets of Anchovies. He’s a big fan of Santisi — and we appreciate his recipe. Santisi hails from northeastern Sicily in the province of Messina, and it is well matched to the BIG flavor of this sandwich. Take a look at Scordo’s site to see the beer that he matched with this sandwich! Mary and Luanne sharing olive oil tips. 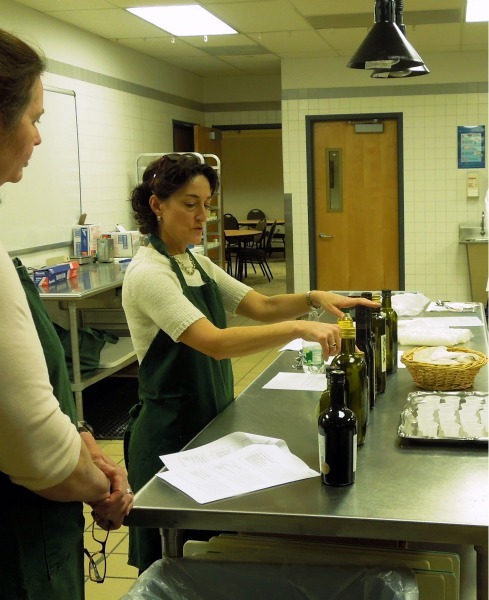 College Classes on Olive Oil Tasting? That would be our wish. How about a super nutrition class on why good food is better and worth the effort? Does anyone know of a liberal arts seminar on this? Until then, we’re happy to help out with tastings at culinary programs, like this week’s session in the fabulous test kitchen in NOVA’s Culinary section of the Hospitality Department (Northern Virginia Community College). We’re practically neighbors, and we appreciate their interest in …..food! We shared a tasting beginning with a bland, disappointing, fusty and rancid oil. We had fun noting the characteristics such as fruity, grassy, and herbaceous. The peppery burn (pizzicata) was well noted! The best question of the day: Where does the peppery sensation go when the great olive oil is on food? 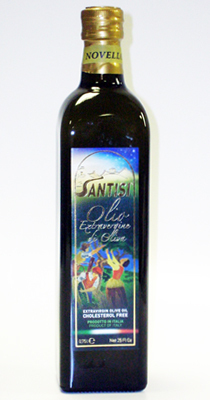 Santisi is an Olio2go favorite and we’d like to share their web commercial with you. You can order Santisi here. Santisi Olive Oil – Sicily’s Golden Gift. Vicidomini Eliche Cascarecce -- It's pasta! Around here we’re calling it “Vici” (VEE-chee) — that’s the Vicidomini artisanal pasta from a family that’s been making pasta commercially since 1812. (Do I hear an overture?) Vicidomini comes to us from near Salerno in Campania — the land of buffalo mozzarella and San Marzano tomatoes! No wonder they have the best pasta. It’s well priced at $6.50 per 500 gram bag. Try it with a local olive oil such as Gargiulo’s Syrenum DOP Penisola Sorrentina 2008 or a Sicilian, Santisi 2008. 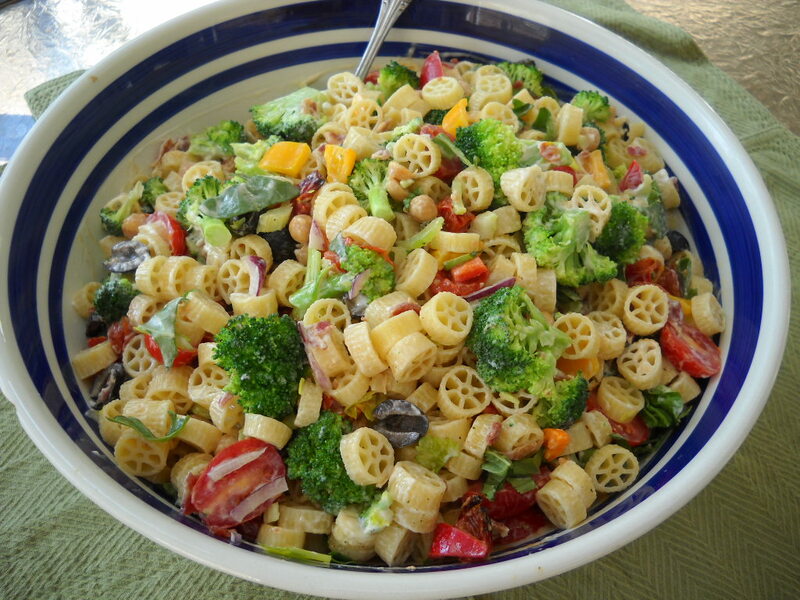 The bounty of summer is upon us and each day features meals with fresh produce and great olive oil from Olio2go! –A lightly prepared tomato “sauce” with heirloom tomatoes, fresh garlic, and basil — and Frantoio di Sommaia. More inspiration in a bottle! The arrival of Olio Verde al Limone at Olio2go was enough to change our dinner plans. Suddenly inspired by a fresh new flavor, the simplest cheese ravioli set the stage for this lemony goodness. Each pasta bowl was filled with a few ravioli, a dollop of ricotta, a drizzle of Olio Verde lemon oil, and a dusting of freshly ground sea salt and pepper. More ethereal than a squeeze of lemon, “al Limone” brought forth clear flavors demonstrating that the simplest presentations can result in the most satisfying of meals. With a salad of field greens (in a bowl rubbed with garlic and tossed with Santisi Novello (that 750 ml bottle lasts a long time! ), Manicardi 12, and freshly ground salt and pepper). All this meal needed was a little plate of cookies and a bowl of fruit for dessert.